Realising that the rust attack on the garlic meant the plants had stopped growing, it was obvious that the time had come to pull the plants and see what could be saved. The bulbs are tiny; the picture has by chance a crown cap from a beer bottle in it but that's a clue to the scale of the crop. I've trimmed and cleaned the outer leaves and have left quite long stalks in the hope the drying bulbs will pull a little of the goodness back into themselves as they dry. It'll make plaiting easier too, if that seems worthwhile at all. Paradoxically this pathetic harvest has made me feel a little better about the garden and I'm marginally more inclined to keep fighting the blight on the potatoes and outdoor tomatoes, to plant out cabbage seedlings that are languishing in pots and maybe even start some autumn vegetables before it's too late. However, in fear of a false dawn I make no promises there. I'll do what I can, but for this year, I'm not a gardener, just one of my many other personas and she doesn't like to get her hands dirty at all. 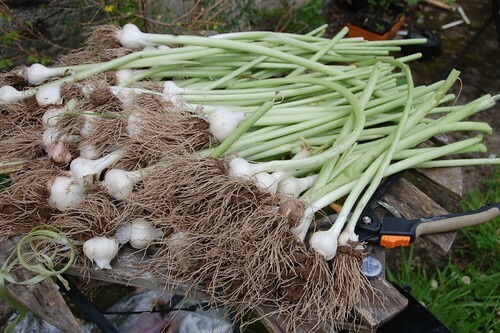 The elephant garlic has stood up to the poor conditions rather better seemingly able to withstand the rust and equally more robust in the face of sodden cold conditions. The bulbs are as good as I might have expected in a more normal year. A few are very good indeed. However, does anyone know how to break the dormancy on the little bulbils that are produced between the cloves? It seems such an obvious and intentional way of propagating the plant. 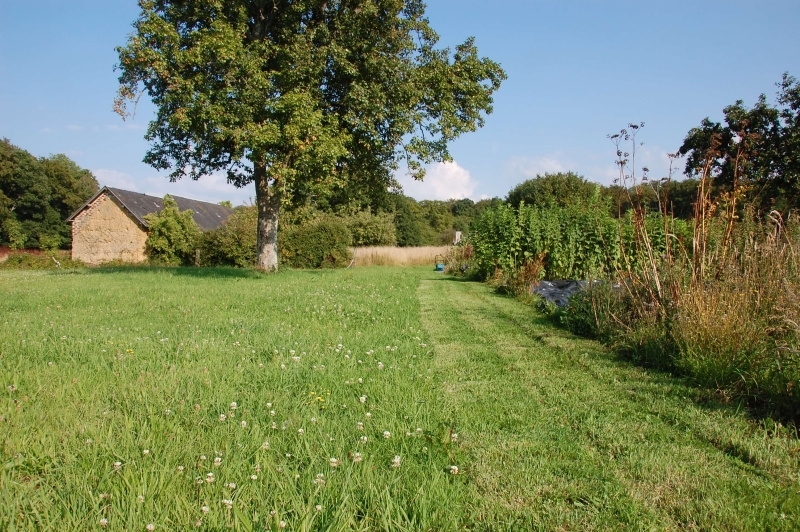 Last year I found this article which seemed to answer all my questions but despite carefully snipping the bulbil coat and replanting them immediately after harvest nothing came up at all. 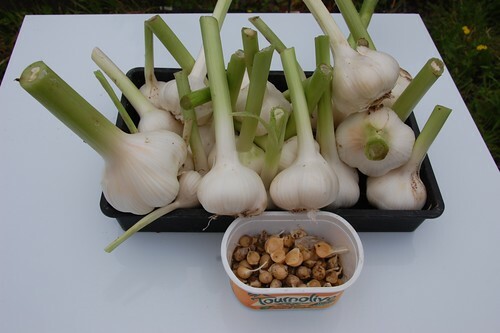 Thinking hard about it, and noting that the plant multiplies readily from the individual cloves anyway seems to indicate that these bulbils are a back up method of reproduction, perhaps only of use in time of drought or inundation when the main bulb has been destroyed. In that case, some form of stress needs to be be brought to bear but should it be heat, damp or cold - and does anyone have the slightest idea what I'm on about? A hope is arising that the summer might yet recover. There is talk of the jet stream moving, that more settled and warmer weather will result and the excessive rainfall and chilly temperatures will be no more. I'm not sure whether there is a basis in science for this hope or if even meteorologists have succumbed to wishful thinking but if we all hold our breath together perhaps we can influence our environment and bring back the sun. I've had the bulbils come up several times. Plant them, leave them, and see what happens. Maybe I've just been unlucky then, thanks for letting me know.